One of the leading agency in Sri Lanka. To have a nice vacation and a knowledgeable tour in Sri Lanka, without any doubt you can get there help. I met real people for the first time. Something more than working place. The best travel company that I have ever come across in Sri Lanka. Professional service and world-class customer support. I highly recommend. One of the leading Tour services in Sri Lanka. To have a nice vacation and a knowledgeable tour in Sri Lanka, without any doubt you can get there help. Fabulous service. Do ask for Reshanka. He is an absolute gem and always ensures everything is taken care of Thanks Mr.Ranjan!! Great place to plan your holiday. One of the best travel agency in Sri Lanka with very helpful and kind (Mr.Chandana). Even for details also they provide their best to cater the guest in the best way. There are a lot of options to create your holiday perfect. Worth a try to have a tour with them. It was a wonderful experience to travel with the sri lanka dream tour all at an affordable rate and to stay in luxury hotel and the best guide to travel with. Thank you very much sri lanka dream tour &the team. It was an exciting experience to travel with family all at the reasonable rate. staying at pleasant hotel, to travel with the best tour guide Mr.Ranjan provided by the sri lanka dream tour. Thank you. I went to sri lanka with my friends then I contact to sri lanka dream tour, they provide all facilities…they provide neat and clean cab, driver (Mr.Ranjan) is very responsible and behave very politely, which makes our journey very easy…Thank you. Professional and efficient service. Highly recommended. Booked a hotel through Sri Lanka Dream Tour. The sales person was extremely helpful in the selection of the same and guided for the itinerary, places to visit, etc. Good professional service! The best travel company that I have ever come across in Sri Lanka. Professional service and world-class customer support. I highly recommend Sri Lanka Dream Tour!! Good service. Sticking to the promised dates is excellent. I have very good confidence regarding Sri Lanka Dream Tour. Supporting and loyal staff. Sri Lanka Dream Tour. good and friendly staff also they have a good price. I have to travel with them many times. and every time they provide me the best option. if you want an immediate driver this company have the option. and whenever someone wants to change also they can provide that. I recommend this place as a good place for your dream tour. Sri Lanka Dream Tour Is the number one travel agent in Sri Lanka currently. Offers every possible travel related services to both individual and corporate clients. Impeccable service can be expected at all times. Has several branches and offers the services of a specialist branch; for package travelers. Had an extraordinary experience with our guide. He made our trip to Sri Lanka even special. The places we visited became more memorable as description and explanation about each and every detail, they were valuable and insightful. Comparable to the beauty of its nature and the hospitality of the local people, he has indeed created this journey as one of the many that we will remember. Thank you Sri Lanka Dream Tour for providing us this opportunity to embrace Sri Lanka ‘s history, culture, heritage, and nature. We will certainly share our joy with friends and family back home. Credit to Sri Lanka Dream Tour to make my trip so wonderful and awesome. Excellent & extra mile services, I indeed have been well taken care of during my holidays in Sri Lanka. Being thankful as well to Sri Lanka Dream Tour for being patient to communicate with me despite it has been after her working hours in order to complete my confirmed itinerary. At last to Sri Lanka Dream Tour for contacting me every 2 days to make sure everything is in order, thank you. You guys are rock! Booked a trip with Lanks for a two week trip around Sri Lanka. They were very accommodating to all of our needs and requests. We could not recommend them enough. Our guide was the best tour guide I've ever had. He went above and beyond what would be expected. Not to mention he was a lovely and friendly person who was kind and considerate to all of us. We will be recommending Sri Lanka Dream Tour to our family and friends. I booked our 8 day Round Trip from the 19th-26th December with SLDT through Rasanka after countless back and forth emailing before finally making a decision. Communication with Rasanka was fantastic and ultimately it was his customer service that won SLDT the trip. I was travelling with my family of 7 and SLDT were one of the only companies to point out that if we didn't have soft bags we may be tight on space. We booked a larger vehicle than the standard one that most others priced - 8 seats in the back without moving seats and the extra seat in the front. Having booked the trip, Mr. Damith and Ayesh (our driver) accompanied us for the whole 8 days. Our experience with SLDT totally exceeded our expectations in every aspect - the guys literally could not do enough for us and went absolutely out of their way above and beyond their job responsibilities to make sure that we were seeing and experiencing the best of the best of their country in the safest most comfortable way possible. I had booked the trip on the basis of travelling from A-B with a loose day to day itinerary but the guys gave their recommendations on the logistics, what to do, what to leave out, what to change, what we were missing, where to stay (or not), where to eat, how to fill our days etc- we had such confidence and trust that Rasanka and Ayesh had our best interests at heart that it got to the point where we just went with all of their recommendations. They organised our Safari, Spice Garden tour, Tea factory tour, Sigiriya tour to name but a few.It was the little things that made the big difference however - stopping off at 5 different places to collect varieties of mangoes for us to try, pulling over on the side of the road to taste corn and understand what Cashew and banana trees looked like, stopping at waterfalls when we didnt even ask, bending over backwards to help us find a lost phone, keeping in contact after we had left them to make sure we were happy the rest of the trip etc. I can only put it down to their passion to share their beautiful country and determination that we left having had the best experience because as I said it was above and beyond just transport from A-B. It is also worth pointing out that the safety of Ayesh's driving and quality of the van was also fantastic. Finally - on top of all the above, they were just really nice, trustworthy people and we enjoyed their company day to day - they made our trip. Buen servicio, Chin y Priyantha son muy amables, te ayudarán en lo que necesites, intentan amoldarse siempre, vehículos nuevos y cómodos. Fantastic experience in srilanka with Sri Lanka Dream Tour guide and car here. I do not face any issues and problem where I go. We just had a super 3 weeks with chinthaka Ekanayake. Top guide/driver!!! Friendly/helpfull and gave us the best holiday ever! Chinthaka and Isuru have been our drivers for 7 days around Sri Lanka, giving us recommendations about hotels, homestays, restaurants and places to visit. Always on time and taking us wherever we told them. On top of that they explained us about the culture, traditions, and places we passed through. So they made our tour a pleasant trip. Also mention the competitive price Rasanka offered us. We have just returned from a 11day tour around Wonderful Sri Lanka. I contacted Rasanka with my itinerary and he offered us a driver & comfortable car. communication from that point was excellent. We arrived in Sri Lanka where Indika our driver greeted us at arrivals he gave us a local sim at this point. And we started our Sri Lankan tour Indika was great, taking us to what we had highlighted but also suggested other things we could see and do with out pressure and seeing things that you might not normally see. Indika always made sure we were comfortable and provided water everyday, stopping at the amazing fruit stalls. And freshner stops as requires Indika took us to his family home where his wife showed me how to make Dahl, we had a lovely lunch. Indika also was helpful in suggestion eateries. He arranged a jeep safari for us where we saw sloth bear,leopard and elephants. My husband had a birthday while in Sri Lanka and Indika and Rasanka both got him a gift. We had a fabulous and enjoyable tour and if you are lucky you will have the pleasure of Indika and his driving experience and knowledge of his country. 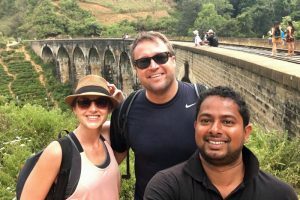 My friend and I just completed a 7 day tour around Sri Lanka with Chinthaka and Sri Lanka Dream Tours! I would highly recommend anyone to book with them, they stand out for their; - Excellent friendly honest service - Pre-holiday itinerary planning and no-fuss on trip adhoc changes- Reliability and timeliness - Competitive pricing - Worry free journeys with clean reliable car - Safe and secure travel with local SIM card provided for contact - Continuously checking on our experience to ensure we’re happy!- Overall fun, laughter and enjoyment! Thank you Chinthaka and Rasanka for a very memorable and active trip, we hope to see you again soon. Me and three friends of mine arranged for a 10 day tour with Sri Lankan Dream Tours and must say it has been a great experience. We contacted Rasanka (the owner) via viber at first, and we had a very professional and fast reply, with affordable prices. We mentioned what we wanted to see and Rasanka set up an itinerary that was great. He formed an itinerary for us, which included Elephant Sanctuary, Lion Rock, Sigiriya, Polonnaruwa ancient city, Sceneries at Kaudulla National Park, Pidurangala rock temple hike, Ritigala Forest Monastery, Dambulla cave temple, Nuwara Eliya, Kandy, Ella, Climb Adam’s peak visit for sunrise, Mini Adam’s peak hike, nine arch bridge, Rawana waterfall, Hikkaduwa and Galle.Saman, our driver, has become a friend after this trip. He is a very kind man, an experiencied guide who helped us in everything we needed. He gave us the freedom to choose and manage the trip as we wanted. He has a wealth of knowledge full of information, knowledgeable, friendly, safety conscious and good sense of humour. Thank you very much for all your help. So, the trip ended with a new friendship, and memories of a great time spent in Sri Lanka. I can highly recommend Sri Lankan Dream Tours, Saman and Rasanka made our trip a safe and rich experience. We had a wonderful holiday in February. Chin was our driver and guide. He was wonderful !! There was a lot of traveling but it was well worth it to see all the beautiful scenery and very varied architecture. 6 days touring and 6 days at Hikkaduwa. We highly recommend this company. Had great tour of 7 days with my family & our driver sujeewa was fantastic- very helpful and guided us through out our trip. Also owner rasanka very earnest and responded promptly for any requests. We chose to travel with SLDT while on our trip to Sri Lanka. And we had a lovely time there. Our driver Chinthaka was wonderful. He was giving us all the information regarding the country and the places. He took us to all the places we wanted to visit and also gave his inputs about the other good places in Sri Lanka. He is an amazing driver and we had a wonderful time with him. Sri Lanka is an amazing country to visit with lots of fascinating places to go to.We had a super tour.Thanks Rasanka and Chinthaka. 8 días muy intensos por Sri Lanka, y gracias a vosotros hemos podido aprovechar cada minuto. Destacar la profesionalidad del chofer Indika, atento, puntual, educado, detallista... Ha sido como un hermano mayor donde nos ha ido aconsejando y cuidando durante todo el viaje. Sin duda sois la mejor opción si podemos volver algún día. Gracias por todo Indika, eres un gran profesional y mejor persona.Abrazos. We booked the travel with Sri Lankan Dream tours while we were at spain. A friend recommended us this company. We are fully satisfied with the service. Our driver Mr Indika is awesome. He is really friendly. He is a really experienced driver. He is always explaining all the posibilities in the travel in order you take the best choice and enjoy as much as it is possible the travel. Indika is always controlling everythig to take care of you. Is the best choice to visit Sri Lanka. We are very happy about the service. The communication preparing trips shedule was very quick. Rasanka offered very interesting trip. He also booked accomondation. We liked it. The driver Ranjan was also very frendly and good driver. He tried to do all his best about our wishes and to make our holidays very interesting. We definitely recommend this agency. Sri Lanka is wonderfull... just need to know how to move arround and Mr Chintaka does; very good english, nice, kind, polite, educated and a perfect driver and guide. Thank-you Chin!! We contact Rasanka by email and all was very easy and nice from the vegining. Good job!! Mr Chintaka and Mr Turin were amazing, nothing was too much for them. We've been travelling around Sri Lanka with our driver Mr. Ranjan Perera. We first contacted Ransanka (the owner) by email, and we had a very professional and fast reply, with affordable prices. Ranjan our driver and part of the company too, has become a friend after this trip. He is a very kind man, an experiencied guide who helped us in everything we needed. He gave us the freedom to choose and manage the trip as we wanted and never gave us a bad advice. In fact he made us very good recommendations about excursions, sites and restaurants and he treated us as his family. I just can say, that we had a wonderful holidays and we owe a part of it to him.Thank you very much for all your help, Sir! You make Sri Lanka a great country.Jen & Marc from Barcelona. 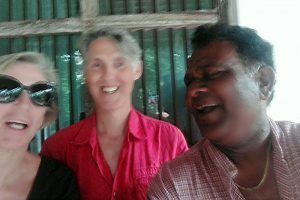 We have just gotten home from a two week vacation in Sri Lanka led by Chinthaka (the guide) and Mr. Turin (the driver). Each day their punctuality was spot on and both were very polite.Chinthaka was very knowledgeable and his English was very good. He always went the extra mile to make sure we were happy, including cooking us an amazing meal when we accidentally chose a self-catering accomodation in the middle of nowhere. Mr. Turin was also great, the van was always spotless and he was always a phone call away if we wanted to quickly relocate.Thank you both for helping make our trip such a memorable one. A group of us from Malta enjoyed ourselves immensely with all the activities, white water rafting, treks, restaurant choices, places of interest and that extra mile when it comes to having an exclusive BBQ near the lake. Or putting up with our various demands. Thanks for making our trip to Sri Lanka a really memorable one. Myself and my Mam travelled to Sri Lanka in July and booked a weeks tour with Sri Lankan Dream Tours. From the moment I emailed Rasanka, I knew my trip was going to be amazing. He was so helpful and had my trip organised within 24 hours. He knew exactly the kind of holiday we were looking for and made sure there was everything was to our liking. We travelled with our tour guide Mr Ranjan and again we couldn't have asked for a nicer guide. He treated us like we had known him years and made sure it was a week to remember. In 7 days we saw more than I could have imagined and Ranjan made sure we saw the authentic Sri Lanka. I am forever grateful to them for the experiences my Mam and I had and will definitely book a tour with them again on my next visit. If you are looking to really experience Sri Lanka, this is your Travel and Tour Company!!!!!!!! Me and a group of friends had 17 days Srilanka, it was an amazing holiday, Mr. Chinthaka our tour leader and our driver Mr. turin made this trip a special one. We had our own plan but they helped fix it for us and included stuff that we didn't know about. Nothing was much trouble for them and they were always on time and driving safely everywhere. Our driver, Mr. turin is a very responsible driver and always drives very safely, the van is always clean and a modern one. The tour leader Chinthaka looked after us as if we were his own children. Thank you very much. I would recommend this tour company to all my friends. I look forward to having a next time with you. My friend and I are on the last day of our 12 day tour of Sri Lanka. We priced out numerous companies and Rasanka was the easiest to communicate with and affordable. He made pre-planning for trip very easy. Our driver, indika, made the trip effortless and fun. We arrived with a partial itinerary thinking we would not be able to do everything we wanted but he helped us schedule the trip. He even added things we did not know about. He made things easy. There was a lot of car time but he was a wealth of knowledge and would look up anything he did not know the answer to. Would recommend this company and our driver, indika. Prompt and excellent service, car was good, on time and with nice, very cooperative Driver Mr. Indika.I recommend. Thanks Rasanka. I arranged for a 10 day tour with Sri Lankan Dream Tours and must say it has been a great experience. Ours is a family of 4 (2 adults and 2 grown ups). The owner (Rasanka) was most helpful in fine tuning our itinerary and also in providing his views on our choice of hotels. We had a sparkling clean and almost brand new High roof Hiace van with a driver and guide all to ourselves for the entire 10 days. Our tour guide (name Indika Kodi) helped us through all the arrangements like entrance tickets to the various tourist sites (so that we could avail of the discount for SAARC nationals) and also ensuring we get a fair deal at all the various experiences that we opted for. Must add that Indika Kodi was a marvelous bloke. Very knowledgeable about the history and also topography of the sites that we visited and also very courteous and helpful. All in all a very pleasant experience so far. Today is our final day in SL and we have some final Sightseeing to finish before we head to the airport. Thank you Rasanka and Indika for the great experience so far. Sujeewa created a perfect holiday experience. We toured with our guide Sujeewa for 7 days over the island and can honestly say that it has been an absolute pleasure. He was caring for basically everything from booking hotel rooms over recommending the best places to see to driving us safely the whole time. We will definitely recommend him to our friends and family. Me and my friend had a lovely 5 days tour with driver Mr Sujeewa. I mentioned what I wanted to see and Rasanka set up an itinerary that was great. We felt care for, safe and relaxed travelling with Mr Sujeewa for the 5 days visiting Dambulla region, Kandy, Nuwara Eilya back to Colombo airport. Doing it again, I would have skipped Nuwara Eilya, and just turned around after Ramboda Waterfalls. I would also recommend not buying anything at the herb plantation, it is all over priced compared to what you can find in other places.I recommend Sri Lanka Dream tours to everyone. The car was comfortable, clean and had AC. Thank you again for a lovely trip! Together with a group of my friends I visited Sri Lanka from 18th January till 2nd February 2017. 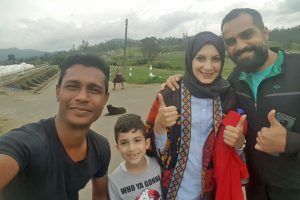 We decided to use some experienced travel agency to make our journey more comfortable and to be able to see as much as possible from this amazing country - choosing Sri Lankan Dream Tours as our guide was the best decision we made.It all started with the very good communication with Mr. Rasanka via email prior our arrival. He helped us with planning of our journey, provided insights into our ideas and supported us with every request we had. Moreover, he was able to very flexibly respond to the situation, when our guide had to be pulled off for several days due to medical reasons - before we arrived to our next destination, new guide was awaiting us there.Our 2 guides - Mr. Indika and Mr. Ranjan were both great. They provided us with such care that we felt like a family members. Nothing was a problem - repairing our broken shoes, arranging birthday cakes and arrangement of the apartment for our friend, finding places to eat or shop. All that together with various interesting facts about Sri Lanka, its history, culture, etc.We truly did not have to worry about anything, thanks to Mr. Rasanka, our 2 amazing guides and our driver. Thank you for making our vacation so memorable! I can highly recommend the agency and especially Mr.Indika who was our guide for 14 days. The man was able to arrange whatever - from mosquito nets in hotels to promt repair of my shoe that fell apart. During the whole stay, he was our experienced guide and great friend! I started to feel really good about my holiday after i have received prompt reply from Mr. Rasanka in reaction to our inquiry. Whithin two days Rasanka was able to provide us (3 couples) with a proposal of detailed itinerary (including accommodation ) based on our preferences. Just as agreed, we were picked up ať the airport in Very early mornin by Rasnka a our guide Mr.Indika , and that is when the fun started and did not ever stop. Indika is extreme friendly, but ať the same time totally professional. Can arrange for whichever crazy wish you might have, is local expert and sincerely wants you to experience the most of his country, yet thinks twice about your budget ať the samé time. If you want to go to Srí Lanka, contact the agency and ask for Mr Indika. He can make the trip unforgetable experience for you! We did 4 day journey with Chinthaka (Chin) through Negombo-Adams Peak-Ella-Tissa-Galle. Journey was extremely successful and great. Program was very good, but Chin was the best. We got so much knowledge of Sri Lanka. Not just places where we visited, but also all things about Sri Lanka. Chin was also very helpfull and safe driver and we loved him. 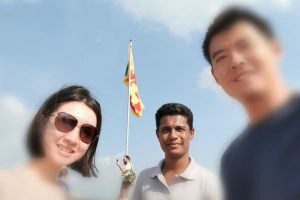 Hope we see Chin and his family in Finland, as we agreed!Teimme neljän päivän matkan Chinthakan (Chin) kanssa reitillä Negombo-Adams Peak-Ella-Tissa-Galle. Matka oli erittäin onnistunut ja hieno. Ohjelma oli hyvä, mutta parasta kaikessa oli oppaamme ja kuljettajamme Chin. Saimme niin paljon tietoa Sri Lankasta. Ei ainoastaan paikoista, joissa vierailimme, vaan myös Sri Lankan elämästä, tavoista, kustannustasosta jne. Chin oli erittäin avulias ja turvallinen kuski ja ihastuimme häneen kovasti. Toivottavasti näemme hänet ja hänen perheensä Suomessa, kuten sovimme! Indika été un excellent driver tout au long de notre séjour à travers ce magnifique pays. Il a pris en compte nos envies, a très vite remarqué nos préférences et s'est adapté. Habitués à voyager (jamais à l'aide d'un chauffeur d'habitude mais pour des raisons de logistique et de temps nous avons préféré cette solution), Indika a su nous laisser notre indépendance et nous étions toujours ravis de le retrouver pour nos trajets, dîners et autres activités. Nous quittons le Sri Lanka avec déjà le projet d'y revenir et évidemment Indika sera le premier au courant ! Je ne peux que vivement le recommander ainsi que Sri Lankan Dream Tours ! Thanks for everything Indi' and see you very soon. Indika was a fantastic host for our Sri Lanka holiday. He was a very humble and knowledgeable driver who showed us a great time. He also has a fantastic singing voice 😉 and I would highly recommend him to show you around the island. Hello! Rasanka recommended and organized a great driver and tourguide: Chinthaka. He picked me up on time in my hotel and drove me to my friends place. He had a good knowledge of exciting activities and restaurants in the area. They drove us around the whole day, organized everything very professionally, all for a good price. Excellent service! With Indika you are not only getting a great driver, but also an excellent tour guide. He is very personable and we sometimes felt like he could actually read our mind. It's not an easy job looking after travellers all day long, but he made it look effortless.If you are looking for a driver in Sri Lanka, look no further! Just came back from a trip to Sri Lanka, and Rasanka and his team did a superb job at making sure I had a great time. My driver, Roshan Jayathilaka, was an excellent driver and just a nice guy overall. He went out of his way to ensure that I was enjoying my trip and that I got to see everything I wanted to see.Roshan was punctual, patient, and a fun gun to have conversations with. He's very knowledgable about his country and always tried to accommodate all my requests.I would most definitely use Sri Lankan Dream Tours again on future visits to this beautiful country. Hello guys! We would like to recommend you this company especially Mr. Indika who was not only our driver but also our tour guide. Thanks to him we saw in 5 days so many things that we could never see if we were travelling by ourselves. He showed us country, shops, monuments, food, spoke about the real life in this country. We can say only Thank you! WE planned to travel Sri Lanka in the last week of October. WE contacted Dream Tours and selected a package . Initially we didn't know about them . Just we saw the reviews and selected . We realised in the tour that our choice is the best one . Full credit goes to our Guide Mr Indica a perfect gentleman . He was waiting for us before we reach. HE explained about the package ,where all we were going to go and sought our opinions. HIS hospitality spoke high of Sri Lanka . He took us to all the main places that was mentioned in package . He took us to Restaurants matching to our taste and budget . He was honest and highly professional. Thanks tor Mr Indica that he made this trip wonderful and memorable .I suggest the readers of this review that you can insist for Mr Indica to be your guide if you go for a package with them . How nice to see Indika below at the picture. It reminds me our visit to Sri Lanka. It is unbelivable that it was more than half a year ago. It was wonderfull time. Thanks to Indika I and my wife had an opportunity to know real life at Sri Lanka. He showed us places with fantastic food and beautifull landscapes out of main touristic roads. He helped us find hotels. We have this stay in Sri Lanka in our memories as very funny, relaxing, extremaly interesting and full of experiences. We dream about doing it one more time with our kids. Thank you Indika and Rasanka!!! We did a trip with Indika. It was excellent. We saw a lot of courious and lovely things. Especially we are grateful to our guide Indika. He explained everything we had to see in his own way - calm and well-informed. Thank you to Indika. Our next trip to Sri Lanka will be together with Indika. Hopefully. I travelled with my family (wife and 3 kids) in July 2016 and had a splendid time; thanks to the tour company and especially to our guide "Mr. Indika" As per plan he picked us up from airport and we drove to Sigriya and on the way stopped at the Elephant Sanctuary, took an elephant ride, next day we climbed the Lion Rock and moved to Kandy; enjoyed the clam and cool weather there and next day moved to Nuwara Elleya. We visited Galle and other spots during our 6 days stay. The best thing besides the magical tourist spots in Sri Lanka was our guide Mr. Indika. He is highly approved by us; thank you SL Dream Tours Travel. He helped us get the best currency exchange rates, ensured that every place we reach on time; get the best seats at Kandy Dance, save money at every activity that we did (and believe me we did a lot of activities). It was 10/10 fun due to this great gentleman. We had very good time in Sri Lanka at the beginning of March 2016. We started to organise our Sri Lanka trip only few days before departure, but thanks to Rasanka and his colleague Damith we had very interesting and exciting time. We visited in 5 days Colombo, Negombo, Dambulla,Kandy, Polonnaruwa, Nuwara Eliya, Sigiriya and others. Sometimes road conditions were difficult, but assistance of Damith helped to avoid any difficulties. Sri Lanka is very beautiful country, extraordinary history and culture, nice people. Nonetheless the traffic in midland is unusual for European, many hotels and restaurants are great value. The country is must-to-visit for those who like pleasant climate, often intact nature, landscapes, age-old culture and history sites, special cousin. 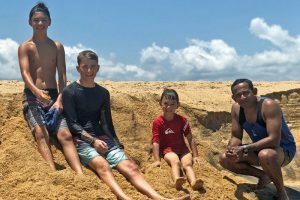 We very much recommend contacting Rasanka, Damith and team if you travel to Sri Lanka – so they may assist you to get out most of your trip. Jesteśmy super zadowoleni z usług Rasanki. Natychmiastowy kontakt, elastyczność w negocjacjach, wiarygodność, super samochód, etc. Ale tak naprawdę nie zapomnimy tego tygodnia dzięki jego kierowcy o imieniu Indika. Czuliśmy sie z nim bezpiecznie na zwariowanych i niebezpiecznych drogach Sri Lanki. Zajęło mu chwilę, żeby wyczuć nasze potrzeby, ale jak już mu sie udało zaproponował nam naprawdę fajną offroadową wyprawę. Nie zależało nam bardzo na zaliczeniu wszystkich atrakcji turystycznych. Chcieliśmy zobaczyć prawdziwą Sri Lankę, i Indika nam ją pokazał i opowiedział. Bardzo polecamy!! Rasanka made our trip to Sri Lanka truly memorable. Thank you for sharing your wonderful country with us! We spent 10 days in Sri Lanka and Sri Lankan Dream Tours made it special. Our driver Mr. Indika met us in airport and brought to our hotel. He helped a lot with a money exchange, finding "offices" with better rates. He is real professional, gave us a lot of useful information and recommendations, helped us with choosing good fruits and etc. I strongly recommend everyone this company if you want to enjoy your holidays in SL and wont be cheated. They will help you to plan all the trip from picking you up from airport, booking hotels, excursions and bringing back to airport. Our expectations were exceeded and every need was met. The guides were well experienced and knew what they were doing and made us feel very comfortable with where we went, ate and slept. also they were very flexible with our itinerary and always recommend optional new places and adventures to try out which we truly and deeply appreciate. I'd definitely recommend trying the services of Sri Lankan Dream Tours to any foreigner AND local. I wish the best of success to Rasanka and his team. Thank you for the memories. Our driver Suji made our stay in Sri Lanka a joy. He drove us for nine days in January 2016, but more than just drive us, he provided invaluable local knowledge, took us to great places and was an honest, trustworthy friend during our trip. I'd highly recommend hiring Suji from Sri Lankan Dream Tours if you need a driver when you visit the country! We arranged for a pick up from the airport late one night and for him to drive us to Kandy from Colombo 2 days later. The whole trip was well organised and he was always punctual and friendly. We would recommend Dream Tours. My sister and I travelled with Rasanka from Kandy to Hikaduwa in April 2015, and then a few days later from Hikaduwa to the airport. Rasanka was great, really friendly and informative. He had lot of interesting stories about the areas we were passing through, but was also happy to let us read quietly when we got a little tired. When we told him that we hadn't booked accommodation in Hikaduwa, he recommended a place that perfectly suited our budget and location - but he was really careful not to be pushy. I highly recommend travelling with this company, and hope to see Rasanka again if we're lucky enough to go back to Sri Lanka. We had a 9 days tour with Sri Lankan Dream Tours and it was all great from the beginning to the end. We had seen some lively places from the beautiful country Sri Lanka and we had stayed at some wonderful hotels with great views. Sri Lankan Dream Tours was very serious in everything they do and I recommend the company with all my heart. Best care with maximum attention to our needs and wants were given throughout the tour in Sri Lanka. Their services were very professional and very care-ring. We recommend visitors around the globe to visit Sri Lanka and enjoy the unique experience we had with Sri Lankan Dream Tours, actually If you need to come true your Sri Lankan dream, go with Sri Lankan Dream Tours, Rasanka is honest, reliable and nice person, He is not running behind only the money, We will recommended Sri Lankan Dream Tours 100% for all worldwide visitors. I’m Rasanka, experience in tourism industry, fluent in English, providing excellent, reliable service to those who wish to discover an independent, safe and enjoyable way with very reasonable charges. Me and my crew are very flexible, will never get angry for anything, you can do anything with us according to your taste. I don’t care about the money, I only think about you, who travel with us. We think that you are the most valuable person, whom we should respect and looked after well during your stay here in Sri Lanka. I know that you are coming to Sri Lanka, to enjoy your holiday with spending a large sum of money which you have earned with lots of difficulties, so I always think and guide you while you are here in Sri Lanka to visit all most all the attractive places and places that you have not heard even. That’s why my services are guaranteed for you to keep this experience in your mind for Ever and also satisfy you in every aspect according to your wish.